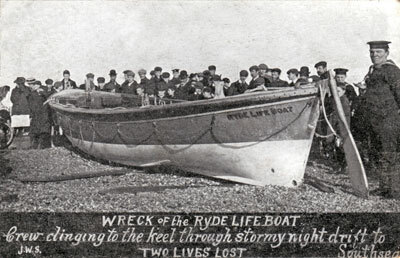 Ryde Lifeboat was located on Ryde Pier from 1869, initially it was funded by public subscriptions and managed by a local committee. The first boat was a 28ft 6in, Lamb and White lifeboat built by J.S.White of Cowes. It had six oars and was kept on a carriage in the boathouse on the side of the pier so that it could be launched at any state of the tide. The RNLI took over the station in 1894. On January 1st 1907, the 30ft 'Selina' was launched with 9 on board to rescue a man reported in a boat during a force 8 storm. After an unsuccessful search, the 'Selina' was making her way back to Ryde when she capsized throwing all her crew into the water where they had to cling on to her. The 'Selina' then drifted across the Solent to Southsea where the cries of her crew were heard and they were rescued - however, two crew members were drowned. The man they were searching for was later identified and it appeared, he had never been in danger. Ryde Lifeboat Station closed in 1923 following the introduction of a motor lifeboat at the Bembridge station. An Independent Lifeboat (the Ryde Sea Rescue Scheme) was introduced at Ryde in 1956 after a double fatality near the pier, the inshore rescue boats are kept at Appley and launched from a tractor drawn trailer.